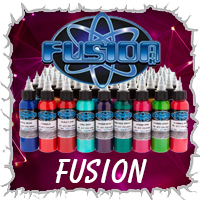 Cantitate : 30mlAcest set contine 60 de tusuri de 30ml:Really Red Brick Red Melon Red Tangelo Orange Atomic Yellow ..
Set Fusion 12 tusuri de baza 30mlSetul contine-White-Basic Black-Really Red-Orange-Atomic Yellow-Emerald Green-Gamma Green-Royal B..
Cantitate per tus: 30mlAcest set contine 5 tusuri de 30 ml: Opaque Grey, Ex. Light, Light, Medium, Dark and Ex. Dark. ..
Set Fusion Gama Opaque Blue 5 tusuri 30 ml Setul contine:-Ex. Light Opaque Blue-Light Opaque Blue-Medium Opaque Blue-Dark Opa..
Cantitate per tus : 120mlSet Fusion Gama Greywash 5 tusuri 120 ml	-Greywash Light	-Greywash Medium	-Greywash Dark	-Greywash XL (E..
Cantitate per tus : 60mlSet Fusion Gama Greywash 5 tusuri 60 ml	-Greywash Light	-Greywash Medium	-Greywash Dark	-Greywash XL (Ext..
Cantitate per tus: 30mlSet Fusion Gama Jeff Gogue 8 tusuri 30 ml	-Super Red -Blackberry Porter -Chinook	-Lotus	-Midnight -Morn..
Cantitate per tus :30mlSet Fusion Flesh Tone 5 tusuri 30 ml	-Flesh Tone Light	-Flesh Tone Medium	-Flesh Tone Dark	-Flesh Tone XL ..
Cantitate per tus : 30mlSet Fusion Gama Roman Abrego 8 tusuri 30 ml	-Bio Orchid	-Dark Seafoam	-Smooth Metal	-Raspberry Cheeks	-Bi..
Cantitate per tus: 30mlSet Fusion Gama Juan Salgado 8 tusuri 30 ml	-Deep Caribbean	-Algae	-Fire Coral	-Shipwreck	-Stringray	-Sea ..
Set Fusion Muted Color 5 tusuri 30 mlSetul contine:-Muted Blue-Muted Purple-Muted Green-Muted Red-Muted YellowACEST PRODUS ESTE EX..
Cantitate per tus: 30mlSet Fusion Gama Nikko Hurtado 8 tusuri 30 ml	-Blush	-Wet Sand	-Red Velvet	-Cold Steel	-Stone Grey	-Artic B..
Cantitate per tus: 30mlSet Fusion Gama Rick Walters 8 tusuri 30 ml	-Smokey Grey	-Basic Black	-True Purple	-Eagle Brown	-Blue Bird..
Fusion Artichoke 30 ml ACEST PRO..
Cantitate:30mlFusion Atomic Yellow 30 mlACEST PRODUS ESTE EXCEPTAT DE LA RETUR, POTRIVIT OUG 34/2014 PRIVIND DREPTURILE CONSUMATO..
Cantitate:30mlFusion Basic Black 30 mlACEST PRODUS ESTE EXCEPTAT DE LA RETUR, POTRIVIT OUG 34/2014 PRIVIND DREPTURILE CONSUMATORI..
Fusion Blue Sky 30 ml ACEST PRODUS ESTE EXCEPTAT DE LA RETUR, POTRIVIT OUG 34/2014 PRIVIND DREPTURILE CONSUMATORILOR.Potrivit ART..
Cantitate:30mlFusion Bomber Grey 30 mlACEST PRODUS ESTE EXCEPTAT DE LA RETUR, POTRIVIT OUG 34/2014 PRIVIND DREPTURILE CONSUMATORI..
Cantitate:30mlFusion Brick Red 30 mlACEST PRODUS ESTE EXCEPTAT DE LA RETUR, POTRIVIT OUG 34/2014 PRIVIND DREPTURILE CONSUMATORILO..
Cantitate:30mlFusion Brown 30 mlACEST PRODUS ESTE EXCEPTAT DE LA RETUR, POTRIVIT OUG 34/2014 PRIVIND DREPTURILE CONSUMATORILOR.Po..
Cantitate:30mlFusion Bubble Gum Pink 30 mlACEST PRODUS ESTE EXCEPTAT DE LA RETUR, POTRIVIT OUG 34/2014 PRIVIND DREPTURILE CONSUMA..
Cantitate:30mlFusion Burnt Sienna 30 mlACEST PRODUS ESTE EXCEPTAT DE LA RETUR, POTRIVIT OUG 34/2014 PRIVIND DREPTURILE CONSUMATOR..
Cantitate:30mlFusion Butterscotch 30 mlACEST PRODUS ESTE EXCEPTAT DE LA RETUR, POTRIVIT OUG 34/2014 PRIVIND DREPTURILE CONSUMATOR..
Fusion Canteloupe 30 mlACEST PRODUS ESTE EXCEPTAT DE LA RETUR, POTRIVIT OUG 34/2014 PRIVIND DREPTURILE CONSUMATORILOR.Potrivit AR..
Cantitate:30mlFusion Cool Mint 30 mlACEST PRODUS ESTE EXCEPTAT DE LA RETUR, POTRIVIT OUG 34/2014 PRIVIND DREPTURILE CONSUMATORILO..
Cantitate:30mlFusion Cornflower 30 mlACEST PRODUS ESTE EXCEPTAT DE LA RETUR, POTRIVIT OUG 34/2014 PRIVIND DREPTURILE CONSUMATORIL..
Cantitate:30mlFusion Dark Flesh 30 mlACEST PRODUS ESTE EXCEPTAT DE LA RETUR, POTRIVIT OUG 34/2014 PRIVIND DREPTURILE CONSUMATORIL..
Cantitate:30mlFusion Dark Magenta 30 mlACEST PRODUS ESTE EXCEPTAT DE LA RETUR, POTRIVIT OUG 34/2014 PRIVIND DREPTURILE CONSUMATOR..
Cantitate:30mlFusion Deep Purple 30 mlACEST PRODUS ESTE EXCEPTAT DE LA RETUR, POTRIVIT OUG 34/2014 PRIVIND DREPTURILE CONSUMATORI..
Cantitate:30mlFusion Emerald Green 30 mlACEST PRODUS ESTE EXCEPTAT DE LA RETUR, POTRIVIT OUG 34/2014 PRIVIND DREPTURILE CONSUMATO..
Cantitate:30mlFusion Flaming Pink 30 mlACEST PRODUS ESTE EXCEPTAT DE LA RETUR, POTRIVIT OUG 34/2014 PRIVIND DREPTURILE CONSUMATOR..
Cantitate:30mlFusion Foundation Flesh 30 mlACEST PRODUS ESTE EXCEPTAT DE LA RETUR, POTRIVIT OUG 34/2014 PRIVIND DREPTURILE CONSUM..
Cantitate:30mlFusion Gamma Green 30 mlACEST PRODUS ESTE EXCEPTAT DE LA RETUR, POTRIVIT OUG 34/2014 PRIVIND DREPTURILE CONSUMATORI..
Cantitate:30mlFusion Golden Yellow 30 mlACEST PRODUS ESTE EXCEPTAT DE LA RETUR, POTRIVIT OUG 34/2014 PRIVIND DREPTURILE CONSUMATO..
Cantitate : 30mlFusion Hazelnut 30 mlACEST PRODUS ESTE EXCEPTAT DE LA RETUR, POTRIVIT OUG 34/2014 PRIVIND DREPTURILE CONSUMATORIL..
Cantitate : 30mlFusion Hot Mustard 30 mlACEST PRODUS ESTE EXCEPTAT DE LA RETUR, POTRIVIT OUG 34/2014 PRIVIND DREPTURILE CONSUMATO..
Cantitate : 30mlFusion Icy Blue 30 mlACEST PRODUS ESTE EXCEPTAT DE LA RETUR, POTRIVIT OUG 34/2014 PRIVIND DREPTURILE CONSUMATORIL..
Cantitate : 30mlFusion Key Lime 30 mlACEST PRODUS ESTE EXCEPTAT DE LA RETUR, POTRIVIT OUG 34/2014 PRIVIND DREPTURILE CONSUMATORIL..
Cantitate : 30mlFusion Leafy Green 30 mlACEST PRODUS ESTE EXCEPTAT DE LA RETUR, POTRIVIT OUG 34/2014 PRIVIND DREPTURILE CONSUMATO..
Cantitate : 30mlFusion Light Blue 30 mlACEST PRODUS ESTE EXCEPTAT DE LA RETUR, POTRIVIT OUG 34/2014 PRIVIND DREPTURILE CONSUMATOR..
Cantitate : 30mlFusion Light Flesh 30 mlACEST PRODUS ESTE EXCEPTAT DE LA RETUR, POTRIVIT OUG 34/2014 PRIVIND DREPTURILE CONSUMATO..
Cantitate : 30mlFusion Magenta 30 mlACEST PRODUS ESTE EXCEPTAT DE LA RETUR, POTRIVIT OUG 34/2014 PRIVIND DREPTURILE CONSUMATORILO..
Cantitate : 30mlFusion Mandarin Orange 30 mlACEST PRODUS ESTE EXCEPTAT DE LA RETUR, POTRIVIT OUG 34/2014 PRIVIND DREPTURILE CONSU..
Cantitate : 30mlFusion Melon Red 30 mlACEST PRODUS ESTE EXCEPTAT DE LA RETUR, POTRIVIT OUG 34/2014 PRIVIND DREPTURILE CONSUMATORI..
Cantitate : 30mlFusion Mixing White 30 mlACEST PRODUS ESTE EXCEPTAT DE LA RETUR, POTRIVIT OUG 34/2014 PRIVIND DREPTURILE CONSUMAT..
Cantitate : 30mlFusion Mixing Yellow 30 mlACEST PRODUS ESTE EXCEPTAT DE LA RETUR, POTRIVIT OUG 34/2014 PRIVIND DREPTURILE CONSUMA..
Cantitate : 30mlFusion Moss Green 30 mlACEST PRODUS ESTE EXCEPTAT DE LA RETUR, POTRIVIT OUG 34/2014 PRIVIND DREPTURILE CONSUMATOR..
Cantitate : 30mlFusion Orange 30 mlACEST PRODUS ESTE EXCEPTAT DE LA RETUR, POTRIVIT OUG 34/2014 PRIVIND DREPTURILE CONSUMATORILOR..
Cantitate : 30mlFusion Periwinkle 30 mlACEST PRODUS ESTE EXCEPTAT DE LA RETUR, POTRIVIT OUG 34/2014 PRIVIND DREPTURILE CONSUMATOR..
Cantitate : 30mlFusion Pomegranate 30 mlACEST PRODUS ESTE EXCEPTAT DE LA RETUR, POTRIVIT OUG 34/2014 PRIVIND DREPTURILE CONSUMATO..
Cantitate : 30mlFusion Power Black 30 mlACEST PRODUS ESTE EXCEPTAT DE LA RETUR, POTRIVIT OUG 34/2014 PRIVIND DREPTURILE CONSUMATO..
Cantitate : 30mlFusion Power Blue 30 mlACEST PRODUS ESTE EXCEPTAT DE LA RETUR, POTRIVIT OUG 34/2014 PRIVIND DREPTURILE CONSUMATOR..
Cantitate : 30mlFusion Power Brown 30 mlACEST PRODUS ESTE EXCEPTAT DE LA RETUR, POTRIVIT OUG 34/2014 PRIVIND DREPTURILE CONSUMATO..
Cantitate : 30mlFusion Power Green 30 mlACEST PRODUS ESTE EXCEPTAT DE LA RETUR, POTRIVIT OUG 34/2014 PRIVIND DREPTURILE CONSUMATO..
Cantitate : 30mlFusion Power Purple 30 mlACEST PRODUS ESTE EXCEPTAT DE LA RETUR, POTRIVIT OUG 34/2014 PRIVIND DREPTURILE CONSUMAT..
Cantitate : 30mlFusion Pretty Purple 30 mlACEST PRODUS ESTE EXCEPTAT DE LA RETUR, POTRIVIT OUG 34/2014 PRIVIND DREPTURILE CONSUMA..
Cantitate : 30mlFusion Primerose 30 mlACEST PRODUS ESTE EXCEPTAT DE LA RETUR, POTRIVIT OUG 34/2014 PRIVIND DREPTURILE CONSUMATORI..
Cantitate : 30mlFusion Purple Heart 30 mlACEST PRODUS ESTE EXCEPTAT DE LA RETUR, POTRIVIT OUG 34/2014 PRIVIND DREPTURILE CONSUMAT..
Cantitate : 30mlFusion Raw Sienna 30 mlACEST PRODUS ESTE EXCEPTAT DE LA RETUR, POTRIVIT OUG 34/2014 PRIVIND DREPTURILE CONSUMATOR..
Cantitate : 30mlFusion Really Red 30 mlACEST PRODUS ESTE EXCEPTAT DE LA RETUR, POTRIVIT OUG 34/2014 PRIVIND DREPTURILE CONSUMATOR..
Cantitate : 30mlFusion Royal Blue 30 mlACEST PRODUS ESTE EXCEPTAT DE LA RETUR, POTRIVIT OUG 34/2014 PRIVIND DREPTURILE CONSUMATOR..
Cantitate : 30mlFusion Saigon Pink 30 mlACEST PRODUS ESTE EXCEPTAT DE LA RETUR, POTRIVIT OUG 34/2014 PRIVIND DREPTURILE CONSUMATO..
Cantitate : 30mlFusion Spring Green 30 mlACEST PRODUS ESTE EXCEPTAT DE LA RETUR, POTRIVIT OUG 34/2014 PRIVIND DREPTURILE CONSUMAT..
Cantitate : 30mlFusion Tahitian Teal 30 mlACEST PRODUS ESTE EXCEPTAT DE LA RETUR, POTRIVIT OUG 34/2014 PRIVIND DREPTURILE CONSUMA..
Cantitate : 30mlFusion Tangelo 30 mlACEST PRODUS ESTE EXCEPTAT DE LA RETUR, POTRIVIT OUG 34/2014 PRIVIND DREPTURILE CONSUMATORILO..
Cantitate : 30mlFusion True Blood Red 30 mlACEST PRODUS ESTE EXCEPTAT DE LA RETUR, POTRIVIT OUG 34/2014 PRIVIND DREPTURILE CONSUM..
Cantitate : 30mlFusion Turquoise 30 mlACEST PRODUS ESTE EXCEPTAT DE LA RETUR, POTRIVIT OUG 34/2014 PRIVIND DREPTURILE CONSUMATORI..
Cantitate : 30mlFusion Turquoise Concentrate 30 mlACEST PRODUS ESTE EXCEPTAT DE LA RETUR, POTRIVIT OUG 34/2014 PRIVIND DREPTURILE..
Cantitate : 30mlFusion Wild Lavender 30 mlACEST PRODUS ESTE EXCEPTAT DE LA RETUR, POTRIVIT OUG 34/2014 PRIVIND DREPTURILE CONSUMA..
Cantitate : 30mlFusion Yellow Ochre 30 mlACEST PRODUS ESTE EXCEPTAT DE LA RETUR, POTRIVIT OUG 34/2014 PRIVIND DREPTURILE CONSUMAT..
Cantitate : 30ml1 buc. Opaque Gray Dark 30 mlACEST PRODUS ESTE EXCEPTAT DE LA RETUR, POTRIVIT OUG 34/2014 PRIVIND DREPTURILE..
Cantitate : 30ml1 buc. Opaque Gray Ex. Dark 30 mlACEST PRODUS ESTE EXCEPTAT DE LA RETUR, POTRIVIT OUG 34/2014 PRIVIND DREPTU..
Cantitate : 30ml1 buc. Opaque Gray Ex. Light 30 mlACEST PRODUS ESTE EXCEPTAT DE LA RETUR, POTRIVIT OUG 34/2014 PRIVIND DREPT..
Cantitate : 30ml1 buc. Opaque Gray Light 30 mlACEST PRODUS ESTE EXCEPTAT DE LA RETUR, POTRIVIT OUG 34/2014 PRIVIND DREPTURIL..
Cantitate : 30ml1 buc. Opaque Gray Medium 30 mlACEST PRODUS ESTE EXCEPTAT DE LA RETUR, POTRIVIT OUG 34/2014 PRIVIND DR..
Fusion Opaque Blue Dark 30 mlACEST PRODUS ESTE EXCEPTAT DE LA RETUR, POTRIVIT OUG 34/2014 PRIVIND DREPTURILE CONSUMATORILOR.Potriv..
Fusion Opaque Blue Ex. Light 30 mlACEST PRODUS ESTE EXCEPTAT DE LA RETUR, POTRIVIT OUG 34/2014 PRIVIND DREPTURILE CONSUMATORILOR.P..
Fusion Opaque Blue Light 30 mlACEST PRODUS ESTE EXCEPTAT DE LA RETUR, POTRIVIT OUG 34/2014 PRIVIND DREPTURILE CONSUMATORILOR.Potri..
Fusion Opaque Blue Medium 30 mlACEST PRODUS ESTE EXCEPTAT DE LA RETUR, POTRIVIT OUG 34/2014 PRIVIND DREPTURILE CONSUMATORILOR.Potr..
Cantitate:30ml1 buc. Blue Mist Pastel 30mlACEST PRODUS ESTE EXCEPTAT DE LA RETUR, POTRIVIT OUG 34/2014 PRIVIND DREPTURILE CONSUMA..
Cantitate : 30ml1 buc. Lemon Drop Pastel 30mlACEST PRODUS ESTE EXCEPTAT DE LA RETUR, POTRIVIT OUG 34/2014 PRIVIND DREPTURILE..
Cantitate : 30ml1 buc. Lush Lilac Pastel 30mlACEST PRODUS ESTE EXCEPTAT DE LA RETUR, POTRIVIT OUG 34/2014 PRIVIND DREPTURILE..
Cantitate : 30ml1 buc. Pastel Pink Pastel 30mlACEST PRODUS ESTE EXCEPTAT DE LA RETUR, POTRIVIT OUG 34/2014 PRIVIND DREPTURIL..
Cantitate : 30ml1 buc. Soft Mint Pastel 30mlACEST PRODUS ESTE EXCEPTAT DE LA RETUR, POTRIVIT OUG 34/2014 PRIVIND DREPTURILE ..
Cantitate:120 mlFusion Greywash Dark 120 mlACEST PRODUS ESTE EXCEPTAT DE LA RETUR, POTRIVIT OUG 34/2014 PRIVIND DREPTURILE CONS..
Cantitate:60mlFusion Greywash Dark 60 mlACEST PRODUS ESTE EXCEPTAT DE LA RETUR, POTRIVIT OUG 34/2014 PRIVIND DREPTURILE CONSUMATO..
Cantitate : 120mlFusion Greywash Light 120 mlACEST PRODUS ESTE EXCEPTAT DE LA RETUR, POTRIVIT OUG 34/2014 PRIVIND DREPTURILE CONSU..
Cantitate : 120mlFusion Greywash Medium 120 mlACEST PRODUS ESTE EXCEPTAT DE LA RETUR, POTRIVIT OUG 34/2014 PRIVIND DREPTURILE CON..
Fusion Greywash Medium 60 mlACEST PRODUS ESTE EXCEPTAT DE LA RETUR, POTRIVIT OUG 34/2014 PRIVIND DREPTURILE CONSUMATORILOR.Potriv..
Cantitate : 120mlFusion Greywash XD (Extra Dark) 120 mlACEST PRODUS ESTE EXCEPTAT DE LA RETUR, POTRIVIT OUG 34/2014 PRIVIND DREPT..
Fusion Greywash XD (Extra Dark) 60 mlACEST PRODUS ESTE EXCEPTAT DE LA RETUR, POTRIVIT OUG 34/2014 PRIVIND DREPTURILE CONSUMATOR..
Cantitate : 120mlFusion Greywash XL (Extra Light) 120 mlACEST PRODUS ESTE EXCEPTAT DE LA RETUR, POTRIVIT OUG 34/2014 PRIVIND DREP..
Cantitate : 60mlFusion Greywash XL (Extra Light) 60 mlACEST PRODUS ESTE EXCEPTAT DE LA RETUR, POTRIVIT OUG 34/2014 PRIVIND DREPTU..
Cantitate:30mlFusion Blackberry Porter 30 ml (Jeff Gogue)ACEST PRODUS ESTE EXCEPTAT DE LA RETUR, POTRIVIT OUG 34/2014 PRIVIND DRE..
Cantitate:30mlFusion Chinook 30 ml (Jeff Gogue)ACEST PRODUS ESTE EXCEPTAT DE LA RETUR, POTRIVIT OUG 34/2014 PRIVIND DREPTURILE CO..
Cantitate:30mlFusion Forest Green 30 ml (Jeff Gogue)ACEST PRODUS ESTE EXCEPTAT DE LA RETUR, POTRIVIT OUG 34/2014 PRIVIND DREPTURI..
Cantitate:30mlFusion G.I. Green 30 ml (Jeff Gogue)ACEST PRODUS ESTE EXCEPTAT DE LA RETUR, POTRIVIT OUG 34/2014 PRIVIND DREPTURILE..
Cantitate : 30mlFusion Lotus 30 ml (Jeff Gogue) ACEST PRODUS ESTE EXCEPTAT DE LA RETUR, POTRIVIT OUG 34/2014 PRIVIND DREPTURIL..
Cantitate : 30mlFusion Midnight 30 ml (Jeff Gogue)ACEST PRODUS ESTE EXCEPTAT DE LA RETUR, POTRIVIT OUG 34/2014 PRIVIND DREPTURILE..
Cantitate : 30mlFusion Morning Shade 30 ml (Jeff Gogue)ACEST PRODUS ESTE EXCEPTAT DE LA RETUR, POTRIVIT OUG 34/2014 PRIVIND DREPT..
Cantitate : 30mlFusion Super Red 30 ml (Jeff Gogue)ACEST PRODUS ESTE EXCEPTAT DE LA RETUR, POTRIVIT OUG 34/2014 PRIVIND DREPTURIL..
Cantitate : 30ml. Flesh Tone Dark 30 mlACEST PRODUS ESTE EXCEPTAT DE LA RETUR, POTRIVIT OUG 34/2014 PRIVIND DREPTURILE CONSUMATORI..
Cantitate : 30ml. Flesh Tone Ex. Dark 30 mlACEST PRODUS ESTE EXCEPTAT DE LA RETUR, POTRIVIT OUG 34/2014 PRIVIND DREPTURILE CONSUMA..
Cantitate : 30ml. Flesh Tone Ex.Light 30 mlACEST PRODUS ESTE EXCEPTAT DE LA RETUR, POTRIVIT OUG 34/2014 PRIVIND DREPTURILE CONSUMA..
Cantitate : 30ml. Flesh Tone Light 30 mlACEST PRODUS ESTE EXCEPTAT DE LA RETUR, POTRIVIT OUG 34/2014 PRIVIND DREPTURILE CONSUMATOR..
Cantitate : 30ml. Flesh Tone Medium 30 mlACEST PRODUS ESTE EXCEPTAT DE LA RETUR, POTRIVIT OUG 34/2014 PRIVIND DREPTURILE CONSUMATO..
Cantitate:30ml1 buc. Bimini Blue 30 ml (Deano Cook) ACEST PRODUS ESTE EXCEPTAT DE LA RETUR, POTRIVIT OUG 34/2014 PRIVIND DRE..
Cantitate:30ml1 buc. Coral Reef 30 ml (Deano Cook) ACEST PRODUS ESTE EXCEPTAT DE LA RETUR, POTRIVIT OUG 34/2014 PRIVIND DREP..
Cantitate:30ml1 buc. Deep Flesh 30 ml (Deano Cook)ACEST PRODUS ESTE EXCEPTAT DE LA RETUR, POTRIVIT OUG 34/2014 PRIVIND DREPTURILE..
Cantitate:30ml1 buc. Deep Ocean 30 ml (Deano Cook) ACEST PRODUS ESTE EXCEPTAT DE LA RETUR, POTRIVIT OUG 34/2014 PRIVIND..
Cantitate : 30ml1 buc. Sailfish 30 ml (Deano Cook)ACEST PRODUS ESTE EXCEPTAT DE LA RETUR, POTRIVIT OUG 34/2014 PRIVIND..
Cantitate : 30ml1 buc. Sea Turtle Shell 30 ml (Deano Cook)ACEST PRODUS ESTE EXCEPTAT DE LA RETUR, POTRIVIT OUG 34/2014 PRIV..
Cantitate : 30ml1 buc. Shark Skin 30 ml (Deano Cook)ACEST PRODUS ESTE EXCEPTAT DE LA RETUR, POTRIVIT OUG 34/2014 PRIVIND DRE..
Cantitate : 30ml1 buc. Tiger Shark 30 ml (Deano Cook)ACEST PRODUS ESTE EXCEPTAT DE LA RETUR, POTRIVIT OUG 34/2014 PRIV..
Cantitate:30mlFusion Bio Mech Blue 30 ml (Roman Abrego)ACEST PRODUS ESTE EXCEPTAT DE LA RETUR, POTRIVIT OUG 34/2014 PRIVIND DREPT..
Cantitate:30mlFusion Bio Orchid 30 ml (Roman Abrego)ACEST PRODUS ESTE EXCEPTAT DE LA RETUR, POTRIVIT OUG 34/2014 PRIVIND DREPTURI..
Cantitate:30mlFusion Blue Steel 30 ml (Roman Abrego)ACEST PRODUS ESTE EXCEPTAT DE LA RETUR, POTRIVIT OUG 34/2014 PRIVIND DREPTURI..
Cantitate:30mlFusion Bruised Plum 30 ml (Roman Abrego)ACEST PRODUS ESTE EXCEPTAT DE LA RETUR, POTRIVIT OUG 34/2014 PRIVIND DREP..
Cantitate:30mlFusion Dark Seafoam 30 ml (Roman Abrego)ACEST PRODUS ESTE EXCEPTAT DE LA RETUR, POTRIVIT OUG 34/2014 PRIVIND DREPTU..
Cantitate : 30mlFusion Organic Green 30 ml (Roman Abrego)ACEST PRODUS ESTE EXCEPTAT DE LA RETUR, POTRIVIT OUG 34/2014 PRIVIND D..
Cantitate : 30mlFusion Raspberry Cheeks 30 ml (Roman Abrego)ACEST PRODUS ESTE EXCEPTAT DE LA RETUR, POTRIVIT OUG 34/2014 PRIVIND ..
Cantitate : 30mlFusion Smooth Metal 30 ml (Roman Abrego)ACEST PRODUS ESTE EXCEPTAT DE LA RETUR, POTRIVIT OUG 34/2014 PRIVIND DREP..
Cantitate:30mlFusion Algae 30 ml (Juan Salgado)ACEST PRODUS ESTE EXCEPTAT DE LA RETUR, POTRIVIT OUG 34/2014 PRIVIND DREPTURILE CO..
Cantitate:30mlFusion Atlantis 30 ml (Juan Salgado)ACEST PRODUS ESTE EXCEPTAT DE LA RETUR, POTRIVIT OUG 34/2014 PRIVIND DREPTURILE..
Cantitate:30mlFusion Deep Caribbean 30 ml (Juan Salgado)ACEST PRODUS ESTE EXCEPTAT DE LA RETUR, POTRIVIT OUG 34/2014 PRIVIND DREP..
Cantitate:30mlFusion Fire Coral 30 ml (Juan Salgado)ACEST PRODUS ESTE EXCEPTAT DE LA RETUR, POTRIVIT OUG 34/2014 PRIVIND DREPTURI..
Cantitate : 30mlFusion Sea Grape 30 ml (Juan Salgado)ACEST PRODUS ESTE EXCEPTAT DE LA RETUR, POTRIVIT OUG 34/2014 PRIVIND DREPTUR..
Cantitate : 30mlFusion Shipwreck 30 ml (Juan Salgado)ACEST PRODUS ESTE EXCEPTAT DE LA RETUR, POTRIVIT OUG 34/2014 PRIVIND DREPTUR..
Cantitate : 30mlFusion Snail 30 ml (Juan Salgado)ACEST PRODUS ESTE EXCEPTAT DE LA RETUR, POTRIVIT OUG 34/2014 PRIVIND DREPTURILE ..
Cantitate : 30mlFusion Stringray 30 ml (Juan Salgado)ACEST PRODUS ESTE EXCEPTAT DE LA RETUR, POTRIVIT OUG 34/2014 PRIVIND DREPTUR..
Cantitate : 30ml. Abyss 30 ml (Mike Coles)ACEST PRODUS ESTE EXCEPTAT DE LA RETUR, POTRIVIT OUG 34/2014 PRIVIND DREPTURILE CON..
Cantitate:30ml1 buc. Android Green 30 ml (Mike Coles)ACEST PRODUS ESTE EXCEPTAT DE LA RETUR, POTRIVIT OUG 34/2014 PRIV..
Cantitate:30ml1 buc. Aurora Purple 30 ml (Mike Coles)ACEST PRODUS ESTE EXCEPTAT DE LA RETUR, POTRIVIT OUG 34/2014 PRIVIND DREPTUR..
1 buc. Bloodberry 30 ml (Mike Coles)..
Cantitate:30ml1 buc. Cosmic Blue 30 ml (Mike Coles)ACEST PRODUS ESTE EXCEPTAT DE LA RETUR, POTRIVIT OUG 34/2014 PRIVIND DREP..
Cantitate : 30ml1 buc. Nebula Red 30 ml (Mike Coles)ACEST PRODUS ESTE EXCEPTAT DE LA RETUR, POTRIVIT OUG 34/2014 PRIVIND DR..
Cantitate : 30ml1 buc. Proton Pink 30 ml (Mike Coles)ACEST PRODUS ESTE EXCEPTAT DE LA RETUR, POTRIVIT OUG 34/2014 PRIVIND DR..
Cantitate : 30ml1 buc. Solar Flare 30 ml (Mike Coles)ACEST PRODUS ESTE EXCEPTAT DE LA RETUR, POTRIVIT OUG 34/2014 PRIVIND DR..
Fusion Muted Blue 30 ml (Muted Color)ACEST PRODUS ESTE EXCEPTAT DE LA RETUR, POTRIVIT OUG 34/2014 PRIVIND DREPTURILE CONSUMATORILO..
Fusion Muted Green 30 ml (Muted Color)ACEST PRODUS ESTE EXCEPTAT DE LA RETUR, POTRIVIT OUG 34/2014 PRIVIND DREPTURILE CONSUMATORIL..
Fusion Muted Purple 30 ml (Muted Color)ACEST PRODUS ESTE EXCEPTAT DE LA RETUR, POTRIVIT OUG 34/2014 PRIVIND DREPTURILE CONSUMATORI..
Fusion Muted Red 30 ml (Muted Color)ACEST PRODUS ESTE EXCEPTAT DE LA RETUR, POTRIVIT OUG 34/2014 PRIVIND DREPTURILE CONSUMATORILOR..
Fusion Muted Yellow 30 ml (Muted Color)ACEST PRODUS ESTE EXCEPTAT DE LA RETUR, POTRIVIT OUG 34/2014 PRIVIND DREPTURILE CONSUMATORI..
Cantitate:30mlFusion Blush 30 ml (Nikko Hurtado)ACEST PRODUS ESTE EXCEPTAT DE LA RETUR, POTRIVIT OUG 34/2014 PRIVIND DREPTURILE..
Cantitate:30mlFusion Bone 30 ml (Nikko Hurtado)ACEST PRODUS ESTE EXCEPTAT DE LA RETUR, POTRIVIT OUG 34/2014 PRIVIND DREPTURILE ..
Cantitate:30mlFusion Cold Steel 30 ml (Nikko Hurtado)ACEST PRODUS ESTE EXCEPTAT DE LA RETUR, POTRIVIT OUG 34/2014 PRIVIND DREPT..
Cantitate : 30mlFusion Liquid Flesh 30 ml (Nikko Hurtado)ACEST PRODUS ESTE EXCEPTAT DE LA RETUR, POTRIVIT OUG 34/2014 PRIVIND D..
Cantitate : 30mlFusion Red Velvet 30 ml (Nikko Hurtado)ACEST PRODUS ESTE EXCEPTAT DE LA RETUR, POTRIVIT OUG 34/2014 PRIVIND DRE..
Cantitate : 30mlFusion Stone Grey 30 ml (Nikko Hurtado)ACEST PRODUS ESTE EXCEPTAT DE LA RETUR, POTRIVIT OUG 34/2014 PRIVIND DRE..
Cantitate : 30mlFusion Wet Sand 30 ml (Nikko Hurtado)ACEST PRODUS ESTE EXCEPTAT DE LA RETUR, POTRIVIT OUG 34/2014 PRIVIND DREPT..
Cantitate:30mlFusion Basic Black 30 ml (Rick Walters)ACEST PRODUS ESTE EXCEPTAT DE LA RETUR, POTRIVIT OUG 34/2014 PRIVIND DREPTUR..
Cantitate:30mlFusion Blue Bird 30 ml (Rick Walters)ACEST PRODUS ESTE EXCEPTAT DE LA RETUR, POTRIVIT OUG 34/2014 PRIVIND DREPTURIL..
Cantitate:30mlFusion Crimson Red 30 ml (Rick Walters)ACEST PRODUS ESTE EXCEPTAT DE LA RETUR, POTRIVIT OUG 34/2014 PRIVIND DREPTUR..
Cantitate:30mlFusion Eagle Brown 30 ml (Rick Walters)ACEST PRODUS ESTE EXCEPTAT DE LA RETUR, POTRIVIT OUG 34/2014 PRIVIND DREPTUR..
Cantitate : 30mlFusion Ole Yellow 30 ml (Rick Walters)ACEST PRODUS ESTE EXCEPTAT DE LA RETUR, POTRIVIT OUG 34/2014 PRIVIND DREPTU..
Cantitate : 30mlFusion Phthalo Green 30 ml (Rick Walters)ACEST PRODUS ESTE EXCEPTAT DE LA RETUR, POTRIVIT OUG 34/2014 PRIVIND DRE..
Cantitate : 30mlFusion Smokey Grey 30 ml (Rick Walters)ACEST PRODUS ESTE EXCEPTAT DE LA RETUR, POTRIVIT OUG 34/2014 PRIVIND DREPT..
Cantitate : 30mlFusion True Purple 30 ml (Rick Walters)ACEST PRODUS ESTE EXCEPTAT DE LA RETUR, POTRIVIT OUG 34/2014 PRIVIND DREPT..